KIEV, Ukraine -- While fighting in eastern Ukraine between government forces and Russian-backed separatists has ground down lately into a war of slow attrition, tension between Moscow and Kiev has been rising over diplomatic expulsions and unfulfilled conditions of a five-month-old peace plan. 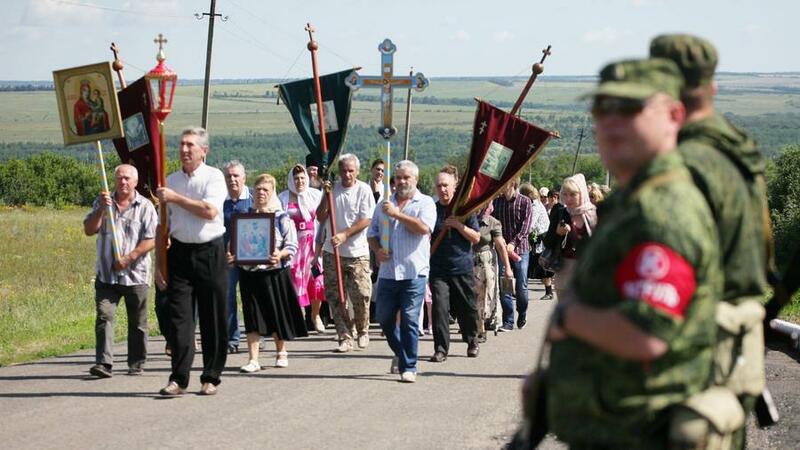 About 200 Ukrainian villagers marched near Grabove on Friday in memory of those killed a year earlier when Malaysia Airlines Flight 17 was shot down over the separatist-held farming town in eastern Ukraine. The Ukrainian government Friday expelled Russia's consul general from the Black Sea port of Odessa, declaring the envoy, Valery Shibeko, "persona non grata" after the Security Service of Ukraine accused him of "actions incompatible with diplomatic activity." "The security service will continue to identify foreigners who work against our government using their diplomatic status as cover," the state security service said in a statement. The expulsion from Ukraine's largest port and centuries-old stronghold of Russian culture followed Moscow's detention of 160 Ukrainian citizens living in Russia who have been ordered to leave, Russia's Sputnik news agency noted. Odessa was the scene of some of the 15-month-old Ukraine conflict's worst carnage last year, when more than 50 died after a day of street fighting ended with Molotov cocktails setting fire to a central building in which dozens of pro-Russia militants had taken refuge. At least 25% of Odessa's population of more than a million is ethnic Russian, and their language remains dominant even 24 years after Ukrainian independence. While tensions flare into confrontation from time to time, the city has largely been spared further incidents of political violence since the May 2, 2014, conflagration. Ukrainian President Petro Poroshenko two months ago appointed former Georgian President Mikheil Saakashvili as governor of the Odessa region. Saakashvili's Georgian army fought a brief war with Russian troops in 2008, when it lost two regions of the neighboring country to Moscow's de facto control. The staunchly pro-Western Georgian has reportedly embarked on a mission to clean up corruption and smuggling in Odessa, the stuff of real and literary crime and scandal. That shift in the region's administration has raised hackles in Moscow as well as among the Russian bosses who control much of the port's trade and shipping. The Kremlin has also accused Poroshenko's government of failing to fulfill the requirements of a European-brokered Feb. 12 cease-fire and peace plan that Ukraine's diverse regions be granted more autonomy to decide local taxing and spending matters and to conduct their own foreign relations. Ukraine's parliament, the Supreme Council, on Thursday approved proposed constitutional changes to enhance the authority of local governing bodies, but the measures fall far short of the self-rule sought by the Moscow-allied separatists who control the Donetsk and Luhansk regions in eastern Ukraine. On Friday, lawmakers set local elections for Oct. 25 but said they wouldn't be held in Crimea, the Black Sea peninsula seized and annexed by Russia last year, or in the separatist-held areas as Ukrainian officials have no access there. The peace plan drafted in the Belarus capital of Minsk five months ago called for local elections to be held in the separatist-occupied areas but within the framework of Ukrainian law. "Kiev has its own and extremely selective interpretation of the Minsk-2 agreements," the Russian Foreign Ministry said in a statement. Moscow backs the separatists' view of the February peace plan -- the second proclaimed from Minsk in less than a year -- that the call for autonomy allows the breakaway regions virtual independence from the government in Kiev. The war, which has taken at least 6,600 lives since it broke out in April 2014 in opposition to the overthrow of a pro-Moscow president, paused Friday as both sides commemorated the one-year anniversary since Malaysia Airlines Flight 17 was shot down over rebel-held territory. All 298 on board died in what Ukrainian authorities and their Western allies believe was the result of separatists mistaking the civilian plane for a Ukrainian military transport. While fighting has waxed and waned since the second Minsk truce was declared, other aspects of the peace plan have also fallen apart. The Organization for Security and Cooperation in Europe, which has hundreds of cease-fire monitors deployed to Ukrainian conflict areas, regularly reports outbreaks of shooting and artillery exchanges. On Friday, the 57-nation security agency that includes Russia and Ukraine reported that tanks and mounted guns that had been surrendered earlier in compliance with the Minsk accords were again missing from the storage depots.